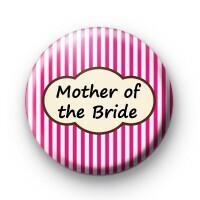 Bright Pink and white Stripey Mother of the Bride Button Badge. Our wedding badges are super popular as keepsakes and handmade favours from your big day. This pink and white design is amongst our most popular. It works well as a Hen Party badge too. We have lots of options in this design so if you need badges for the entire wedding party & family members then take a look at all the designs. All our badges are 25mmand handmade in our workshop in Cornwall.